We have rounded third base and reached the bottom of the barrel. It certainly doesn’t get any easier when we move to the Great Plains, which is unfortunate. Besides having the same topography, three states also share Native America names. Oklahoma means “Red People” in Choctaw. Kansas means “Soft Wind People” in Sioux. Nebraska means “flat water” in Otos. Do the above words carry any meaning? Did I accidentally create a swear word? I don’t know. One of the words may mean “Flat Red Wind,” which could be offensive culturally as well as aromatically. I think I’ll play it safe and call this region North Texas. Again, this would be an interesting looking state. It would have the profile of a tall statue with a small head and an immense beer gut, which may be appropriate for I predict this consolistate will attract students from all over the United States who will want to be near the mountains and desert while studying anthropology and home brewing. And come Fall Saturdays they will pour into the football stadium to cheer The U’Coldazona Wild Ute Buffaloes who love to Vandalize!!! 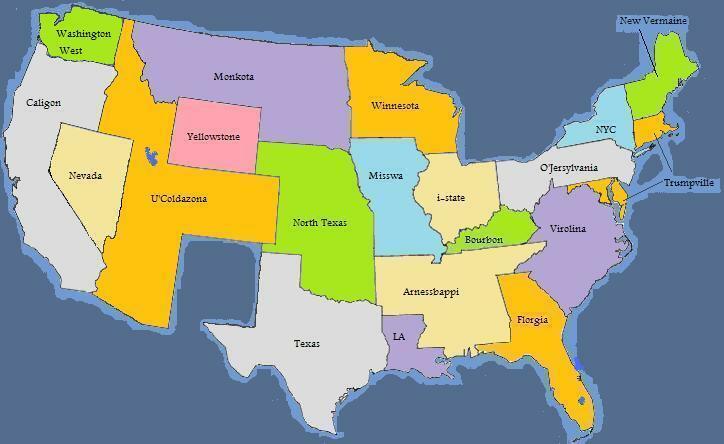 All these states are too tiny to stand on their own. Seriously, my neighbor’s backyard is bigger than Rhode Island. I could understand the need during the colonial period, but come on! It’s time for them to band together and form a state you can actually see on a map. But consolistation might not be enough. In order for them to be viable I think they should also find a corporate sponsor. One that comes to mind: Trumpville. Now I know the above consolistate is not contiguous and would violate one of my rules. But this irregularity would only perpetuate one of my other beliefs. Once you set a hard and fast rule, be sure to immediately break it. This is why I’m suggesting combining Washington the State with Washington the D.C.
With the partisan divide growing more and more acrimonious, it’s only a matter of time before the politicians challenge each other to a duel on the national mall. But for those who aren’t looking to take twenty paces, I have a solution. The Republicans can stay in D.C. with its rich history and architecture and the Democrats can relocate to Seattle with its natural beauty and coffee. Maybe a physical separation may do the country some good. It may give our politicians the breathing space to become reflective knowing the enemy is on the other coast. It can’t hurt. God knows we should try something.